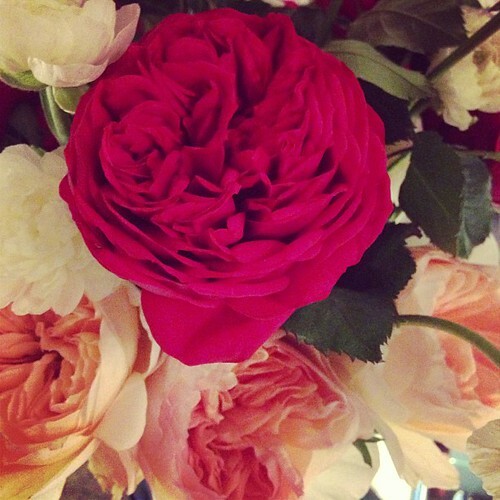 I was raised to adore roses. My mother loved them passionately, and watching her nurture them, prize them, photograph and paint them, I always knew that they were sacred to her. From early on, I came to associate her name, Margaret, with a certain kind of rose. Now I know that Margaret means “pearl”, and though my mother did very much appreciate baroque pearls, her name does not evoke the moony whiteness of an oyster’s gift, or the simple daisies called marguerites, but something far redder, wilder, thornier. If my mother were a rose, she would be a very particular one indeed. I know what it looks like, because when I see one twining over a neighbor’s fence, I am struck with a deep and visceral longing – like what I feel for my long gone mother. 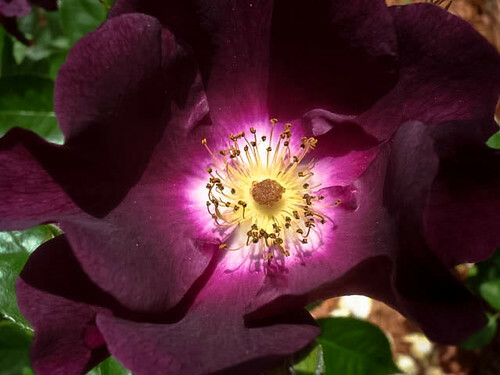 My mother’s rose is deep magenta, the color of the lipstick she used to wear (that I so fiercely coveted) – a ripe fuchsia with a blue sheeny undertone, so dark that it looks purply-black in dim light. 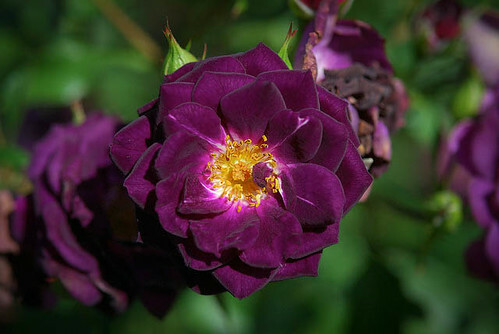 This is a wild rose, some cabbage-y pillowy tea rose bred with a cherokee outlaw bloom, cultivated in rare gardens, tricksy and uncommon. This is no tame garden variety long stem, no – this rose, were you to attempt to pluck one, would prick your fingers cruelly, and then drop all her petals out of spite. Not that’s she’s an evil flower by any means – just one that won’t be contained, curtailed, or bartered for a kiss. This feral rose climbs rampant over stone walls, her spiky canes heavy with dusky nodding heads. These are the fairytale briar roses that enveloped Sleeping Beauty’s castle, and tore her suitors to pieces – enchanted by dark magic and ancient witchery. My Margaret rose only grows way out in the country, on the edge of the woods, and if she could sing a song it would be a strange old one, played on a crackling fiddle with words sung in a low aching voice about lost love. A wild Irish rose, singing gypsy lullabies. I’ve never found one for sale in a nursery, though they do sell a few that come quite close online. Short of ordering one of these bare-root babies, I think the only way to have my own is to work up the courage to knock on the door of one of the granny-ladies in my neighborhood who’ve been growing them for decades and beg for a cutting. One day I’ll figure out the spell to get them to root, and my garden will be tangled with heady blossoms. I do have a beautiful Basye’s Purple in a pot, a birthday gift that came from the Antique Rose Emporium in Brenham, Texas. If it were combined with a Night Owl and perhaps a Midnight Blue, I think it would be the rose I see in my dreams, my mother’s rose. “Michel Almairac created Voleur de Roses (French for “rose thief”) in 1993. The L’Artisan Parfumeur website lists its notes simply as patchouli, rose, and plum. That sounds right to me. Voleur de Roses smells like a Syrah-soaked rose washed over with wet patchouli, moldering wood, and cold plum. The wet has an almost metallic edge, like the ocean. The fragrance’s patchouli is one of its main features, so if you don’t like patchouli, steer clear. 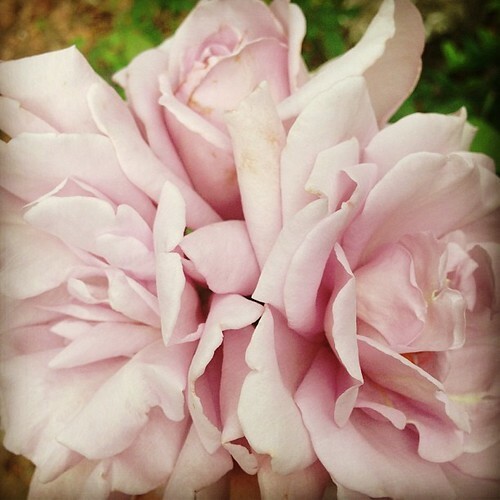 Rose-phobes who do all right with patchouli might like Voleur de Roses. Its rose would be more at home at a dive bar than a garden party. In my mind, Voleur de Roses evokes a bandit with flashing eyes, who kidnaps (consensually, natch) his rose, a lady fair clothed in red silk. She faints beneath his road-dusty cloak, dank with earthy patchouli and sweat, coming to in his arms, nestled a thorny grotto made from rose boughs. A wet garden dripping after the storm, strewn with fallen fruit and scattered petals ground into the damp dirt. Imagine kissing your dashing lover underneath the brambles, and pausing only to feed each other over-ripe jammy plums. Sticky fingers with dirt beneath the nails winding through dark locks, grazing flushed skin striped bloody from rosy kisses. Perhaps that’s a bit extravagant, but Voleur de Roses is that kind of perfume: seriously seducing, yet playfully – slightly nasty in a faun-like way. This is what a very refined satyr might smell like, were his goat’s horns draped with a garland of stolen roses. Not your grandmother’s kind of rose at all. Or my mother’s, really – but it’s a perfect scent for me, a gothic romantic to the core. “A dark, leather-patchouli rose, L’Arte di Gucci has a cult following among certain perfume lovers, and after hearing them sing its praises, I had to see what was up. Black, inky and goth, L’Arte di Gucci is an Edward Gorey-esque animalic-rose chypre. In my fevered imagination, its rose comes from the rose bushes surrounding the dilapidated and haunted Victorian home of Merricat, the witchy protagonist from Shirley Jackson’s We Have Always Lived in the Castle. (On a less literary romantic note, it first brought to mind Calvin Klein’s 2005 perfume Euphoria, a spicy, woody floral that also has “exotic” flowers and notes: rose hips, Japanese apple, green leaves, Lotus, black orchid, red woods, black violet and amber.) L’Arte is definitely the darker — and more beautiful — of the two. 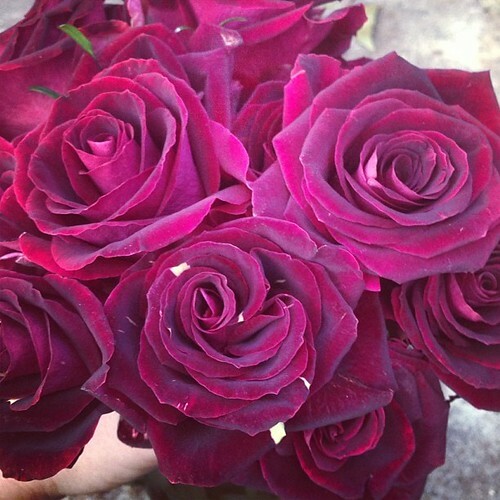 I love these velvety, witchy roses. They’re called HOCUS POCUS! Very apt. Odd little creamy freckles on dark petals. The odder the rose, the better. This rose was just bonkers. It smelled like blackcurrant wine & spiderwebs. Along the way in my search for the perfect rose perfume, I found this helpful list: 25 Rose Fragrances Every Perfumista Should Try. The only one I’ve tried on it is Jo Malone’s Red Roses, which caught my attention when I smelled it on a chic lady shopping for antiques. It does smell red to me, a little – just not quite red enough. Sa majesté la rose and Rose de Nuit both by Serge Lutens do tempt me, as does his La fille de Berlin. 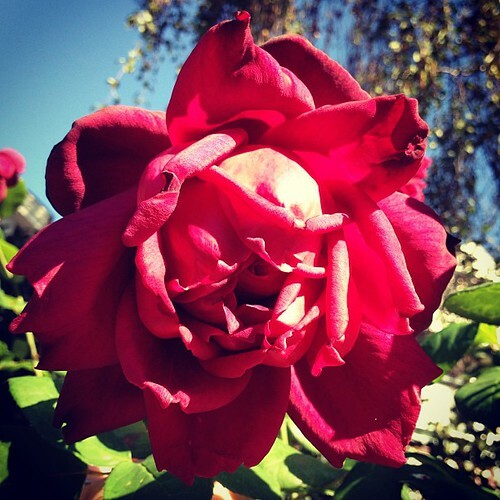 “It’s a deep red rose that dries down to a lusty animalic drydown and takes you on a whirlwind journey along the way. 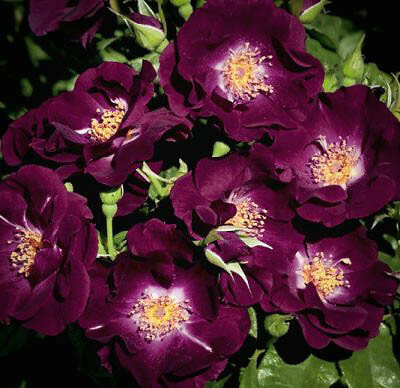 I love its explosion of crimson rose petals, which smell almost sinfully rich with their hint of overripe blackberries. 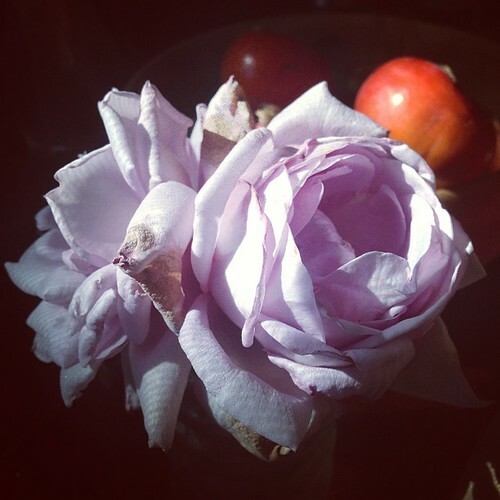 (In the less poetic industry parlance, it’s called smelling money–a rose like that requires a generous budget.) 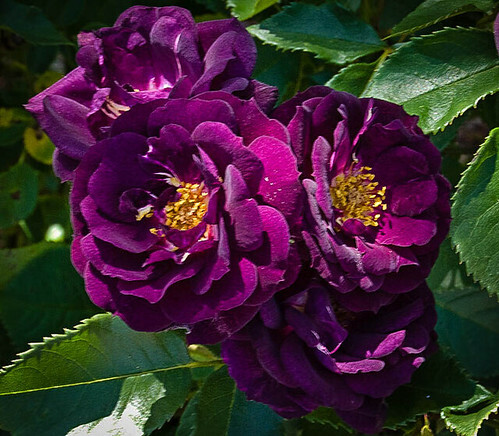 Just like some roses can smell of violet, La Fille de Berlin takes a turn towards dark, jammy violets, making a small nod towards Bois de Violette. …the scent was about finding beauty in the darkness and persevering through adversity with strength and humor, as women in postwar Germany had to do, when they were as plundered as their cities by occupying forces meant to restore order. This story is movingly told in the anonymous best-selling autobiographical book titled “A Woman in Berlin,” clearly an influence. “I wanted to capture in perfume the experience of walking around my garden and smelling each rose, as their perfumes blended in my nose. Wild Roses perfume evokes the garden in our imagination and memory — the book of a hundred petals unfolding: balsamic, spicy, apricot, and honeyed roses, mixed with the smell of warm earth and herbs. 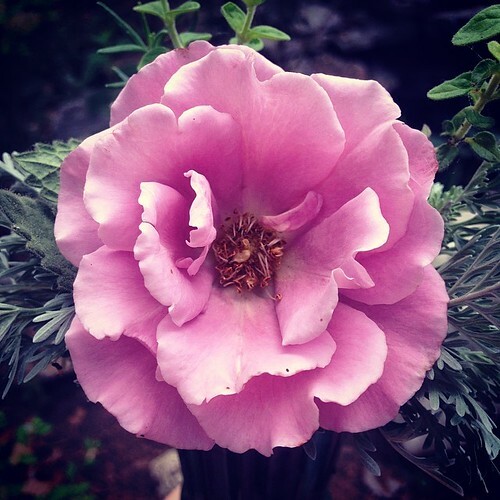 I made a music mix in honor of my rose obsession: Ashes of Roses – Music for burning rose petals on gray days. A soundtrack for burying your nose in a rose. 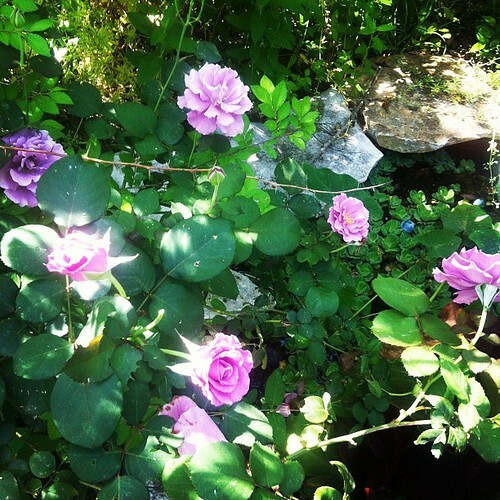 Ashes of Roses from angeliska on 8tracks Radio. 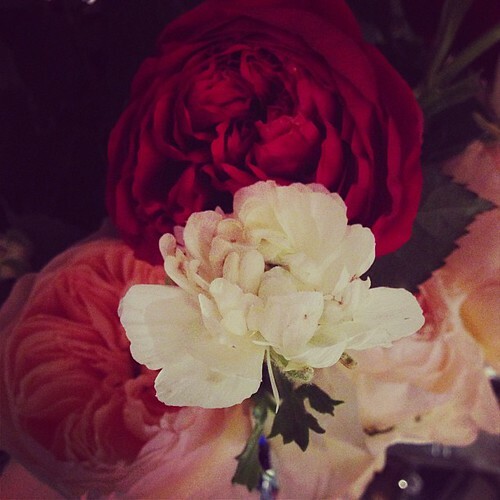 What a gorgeous post about roses. They seem very much an Angeliska flower — lush, visceral, elegant, varied. 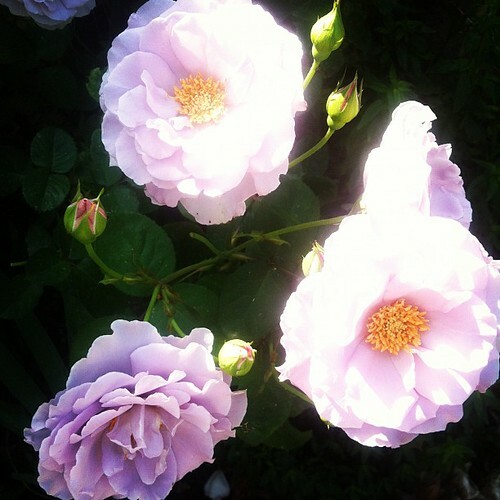 I remember when I went to the Berkeley Rose Garden for the first time and could not believe all the different roses I was smelling, each one with a personality of its own. I love Voleur des Rose and I think you might like Tom Ford’s Cafe Rose, as well, with a clever use of a coffee accord to create an animalic aspect to the rose at its heart. So glad you’re writing again, and I can’t wait to read more! 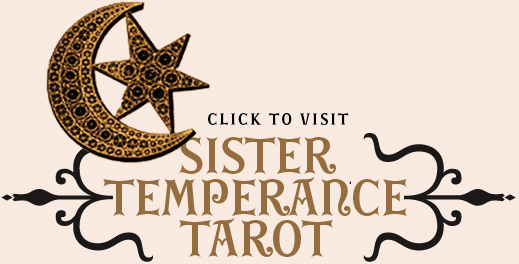 Until we meet again, soon, with perfumes and Tarot in tow, no doubt. 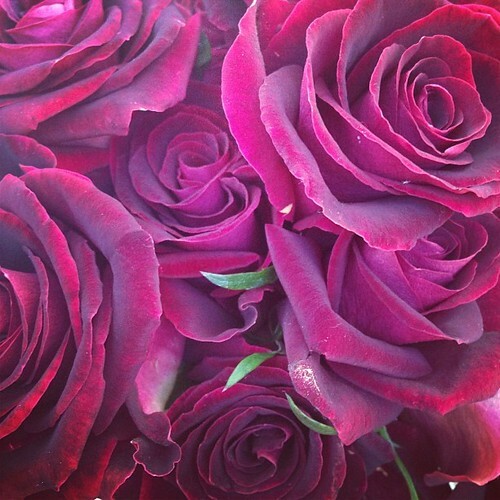 I am a huge fan of roses and rose perfumes, and like you, my preference in perfumes is the darker the better. L’ Arte di Gucci is indeed a masterpiece and I can’t imagine why it was discontinued. Another really great rose chypre to try is Une Folie de Rose from Les Parfums de Rosine. It has a vivid greenness to it and less patchouli than the Gucci, but it’s intense and memorable. Their Secrets de Rose is also fantastic. You’ve conjured such lovely imagery here and brought to mind my mother, who loved rose scented fragrances as well. 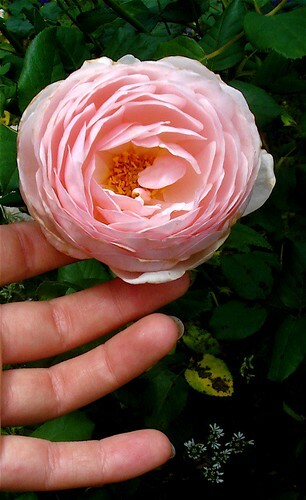 Unfortunately, here favorite was Perfumer’s Workshop “Tea Rose”, which, as my grandmother used to complain, smelled dreadfully like a stuffy funeral parlour. My mother would just smile mysteriously and then proceed to spritz half of the entire bottle on her person.